Following very successful storytelling format experiments with ‘Doctor Who and the Pirates’ and ‘Creatures of Beauty,’ Big Finish continues to toy with expectation with Jonathan Morris’s ‘Flip-Flop.’ Advertisements for the story make it abundantly clear that either disc of two episodes can be listened to first and still create an organised and sensible story. 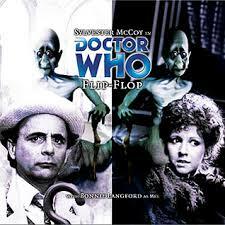 Big Finish even takes the additional step of packaging each disc in a separate case to further drive this point home, and so the question remains if the planet Puxatornee- as the Seventh Doctor and Mel arrive to find a once-thriving human colony struggling to survive- is on the brink of extinction or a place where the alien Slithergees have covertly infiltrated important positions. Perhaps it is both. To make this concept work, Morris focuses on alternate realities, examining the effects of Puxatornee’s President Bailey both living and dying at a certain point in time. Sequences on both discs develop similarly, but it’s the perception of characters that changes depending on which disc is listened to first as they and events are cast in a slightly different light on each. In some respects there are similarities with ‘Creatures of Beauty’ in that, even though the Doctor and Mel experience events cohesively throughout, their time traveling means that events on Puxatornee occur non-linearly, and so the concluding resolution actually happens quite early. This allows Morris to bypass the circular nature of the ending of each disc leading right into the other but also lends an air of bleakness to events as the Doctor’s intervention cannot change the inevitable ruin of Puxatornee. Related to that concept, the story also intriguingly showcases how experiencing and living in two different Puxatornee environments affects the characters, primarily Stewart and Reed played effectively by Audrey Schoellhammer and Francis Magee. In the timeline with the humans in control, they are high-ranking security officers; in the timeline with the Slithergee in control, they desperately try to get their planet back while attacking the invaders and their collaborators. The duo does a good job in succinctly differentiating themselves from their alternate counterparts, but it also allows each to express disgust over the actions their counterparts have taken without knowing that they themselves are responsible as the story comes full circle. The events here give credence to the Doctor’s warnings that time cannot be changed on a whim, and sadly it’s the human colonists who discover this as they try to change their past only to cause the problematic development themselves. The Slithergees also prove to be a rather unique alien menace as it is revealed that they became part of Puxatornee society by acting as a weak minority that needed protection. As President Bailey continues to meet their wants, they gain so much persuasiveness that their desires begin to trump the humans’. The presence of their battleships that could be used if their desires are not meant adds an extra and appreciated level of threat to what Mel describes as visually impaired invertebrates. Bailey played by Pamela Miles and Mitchell played by Richard Gibson also give solid performances as they prove instrumental in setting the events of each disc in motion depending on the response to the Slithergee. ‘Flip-Flop’ benefits from strong performances from each of its performers, and though events and dialogue are understandably repetitive in some cases, there is enough variation and intrigue to keep it from becoming overbearing. Likewise, setting the story during Christmas is a clever concept as it allows Mel to remark on the difference in opinion toward this day in the different timelines, in one as a day of retribution for the dead President and in the other as an insult to Slithergee beliefs. McCoy and Langford play off each other extremely well, and it’s their presence and great dialogue both between themselves and toward other characters that keep ‘Flip-Flop’ from becoming too complex. This is another shining example of a fresh and clever spin on the Doctor Who license.